Chicken Parmesan is one of the dishes at every Italian restaurant in the US. I know why: it’s delicious! 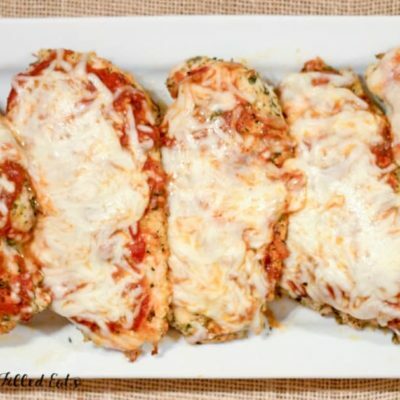 My baked chicken parmesan is fast, grain free, low carb, keto, & and kid approved! Chicken Parmesan is one of those dishes on the menu at every Italian restaurant across America. It is a classic and there is a good reason, it’s delicious! But… it can be very labor intensive to make it at home. I’ll never forget one Saturday 6 or 7 years ago we invited company for dinner and decided to make chicken parm at the last minute. Not the brightest idea. I was still breading and pan frying the chicken when the company arrived. And then it needed to bake for 45 minutes. I think we finally ate dinner after 8. Oops! 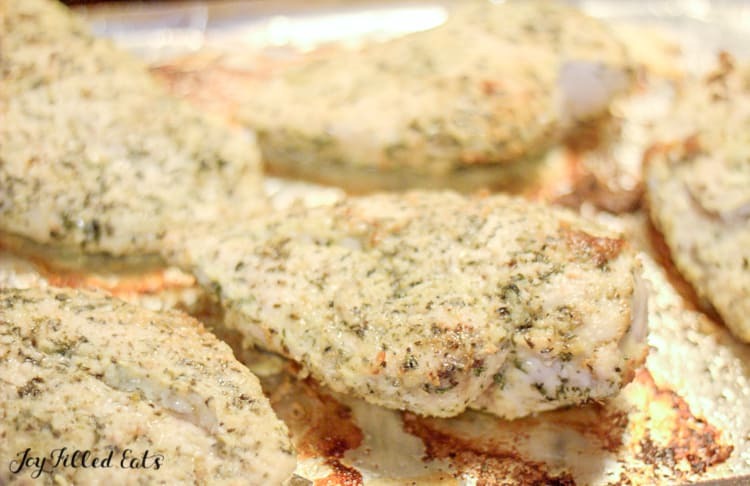 I promise this baked chicken parmesan is much easier. The lazy way to make chicken parm is to just bread it and then bake it in the oven. Since the coating is flourless you can just bake it without pan frying it first. That cuts the prep down to about 10 minutes. As much as I enjoy being in the kitchen I also love easy prep meals. 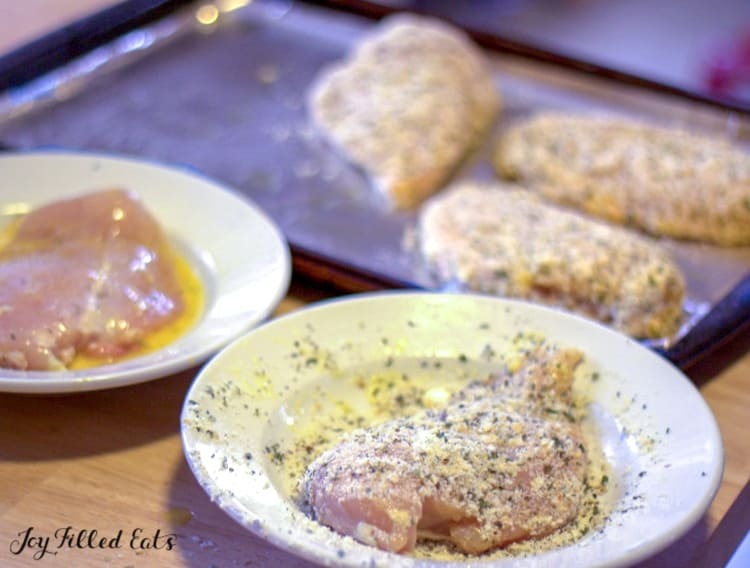 I use a combination of parmesan cheese and herbs instead of traditional bread crumb breading. shredded mozzarella – sliced works too! 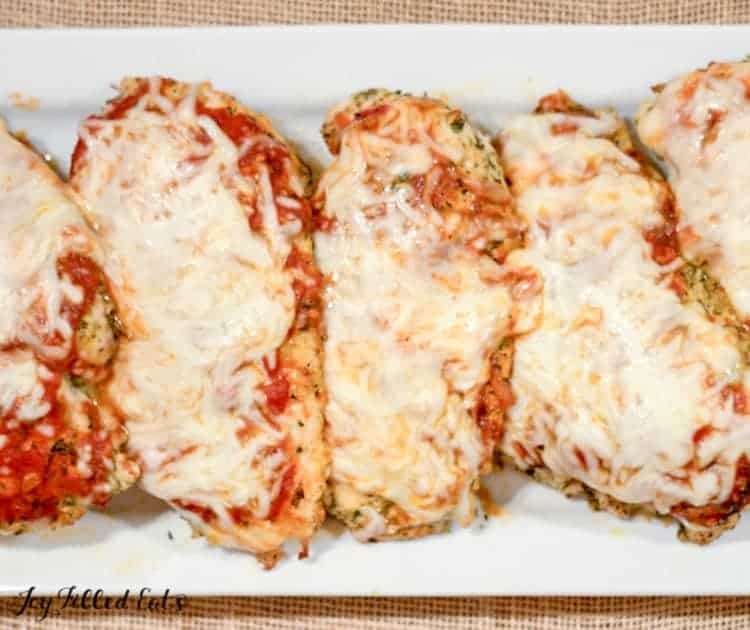 It’s not hard to turn traditional chicken parmesan into keto chicken parmesan. 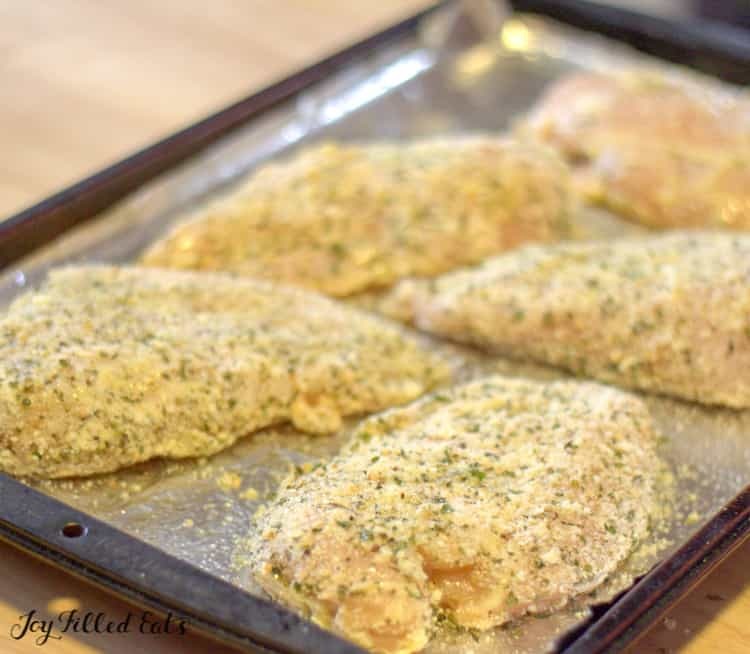 By subbing in grated parmesan cheese for the flour and breadcrumbs you can make this healthy chicken parmesan in no time! Just make sure the tomato sauce is sugar free and you good to go for a great keto dinner. Our favorite side dish for keto chicken parmesan is my homemade caesar salad. Other great side dish options are steamed green beans, garlic broccoli, or zucchini noodles! 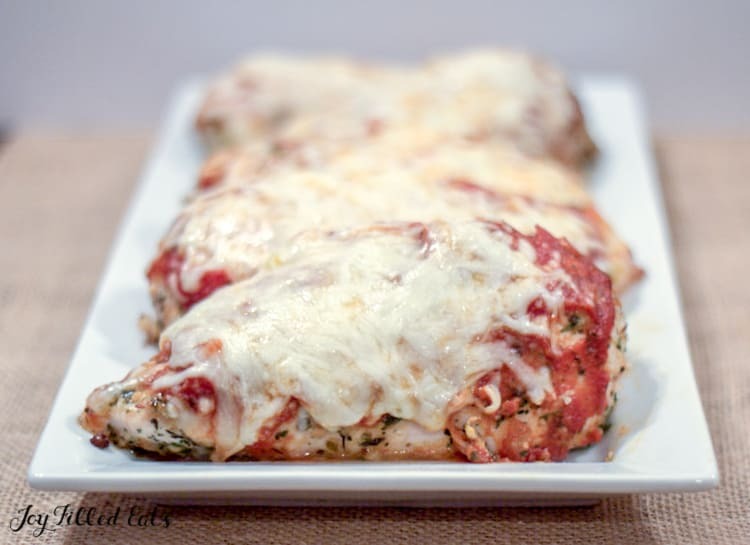 I hope your whole family loves this lazy baked chicken parmesan! Chicken Parmesan is one of the dishes at every Italian restaurant in the US. I know why: it's delicious! 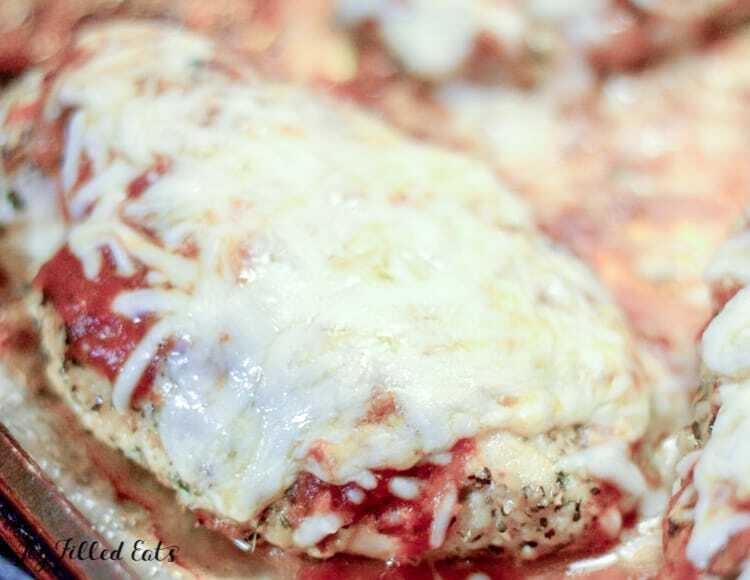 My Baked Chicken Parmesan is fast, keto, low carb, & gluten-free. Check out the video for my Baked Chicken Parmesan right above the recipe! Originally Published March 7, 2016. Revised and Republished December 28, 2018. Do you cover this when you bake it? I feel like chicken often gets dried out. No, I don't. As long as you don't overcook it the chicken will not dry out. The coating helps it stay moist. Eggs: I hate the taste of eggs and so never use them to insure that a coating will adhere. I've used olive oil or greek yoghurt instead on chicken breasts before baking or frying and it has worked out well. At what temp and how long did you cook in the air fryer? 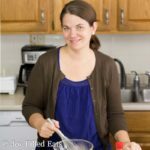 What would you suggest using instead of egg? We have an egg allergy. Maybe just a little water? A little water might work. The egg just helps the coating adhere. You’re kidding right? Mayonnaise has egg so that won’t work. I just did a little water and it worked great. Sara, I typically buy Just Mayo which is egg free. Not all mayo has eggs. I made this for dinner tonight and my husband went crazy for it. Served with a salad, it is as good as any restaurant. I see your nutrition chart says per serving. But what are you considering a serving? Thanks! Just made this for dinner tonight and it was delicious! I served it with your ceaser salad. :) thank you for sharing! It was a big hit around the table!!! Omg. I made this tonight and it was amazing! Hands down so good and adding it to my meal plan rotation! What kind of sides do you like to serve with it? All I can think of is Caesar salad. Thanks! We also will have steamed or roasted broccoli, cauliflower, green beans, etc. Anything green goes well. This recipe is a winner with y whole family! I serve it over Dreamfields pasta to keep it a low carb meal. Thanks for sharing! How many calories is it for one?